Register 30 days early to get the best pricing for the above dates for training in Houston, TX (just minutes from George Bush Intercontinental Airport). Seating is limited. This workshop is appropriate for mental health providers, allied professionals, clergy, students, interns, family clinic staff, professors/teachers of couples therapy, researchers in the social sciences and employee assistance professionals. 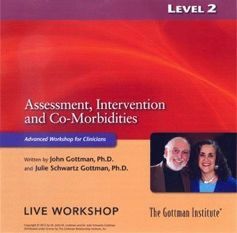 Proof of completion of Gottman Level 1 training is required prior to attending Level 2 training. Continuing Education: 20 CEUs for Texas LCSWs, LPCs and LMFTs. This event is co-sponsored by R. Cassidy Seminars. Psychologists and out of state licensees can register for CEU’s through the R. Cassidy Seminars after completion. Already attended Level 2 and want a refresher? If you attended Level 2 in the past and would like a refresher course, you may attend our Level 2 for a minimal fee. Please contact Mary Beth George or Alysha Roll at 281.812.7529 for more information.